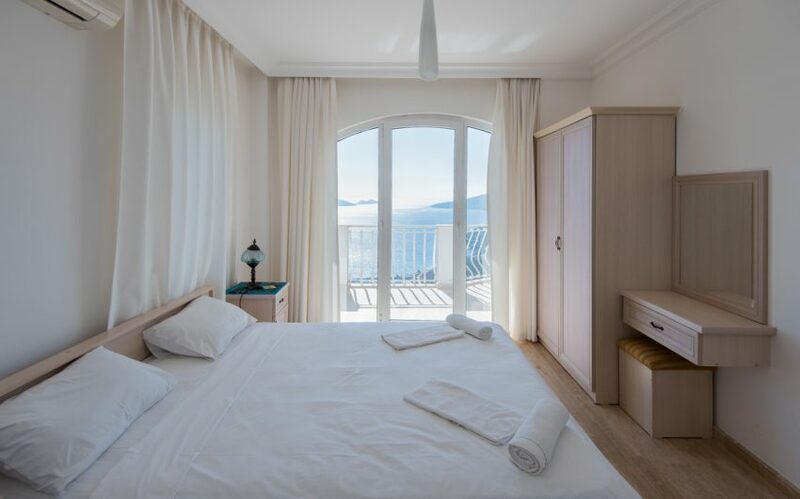 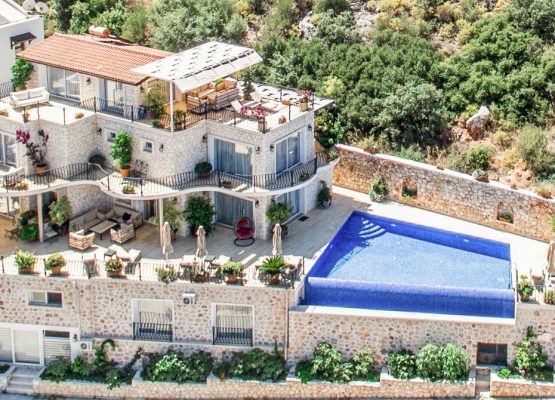 With heavenly vistas and a real ‘home from home’ feel Villa Allure stands out from the crowd in terms of space, amenities, and location. 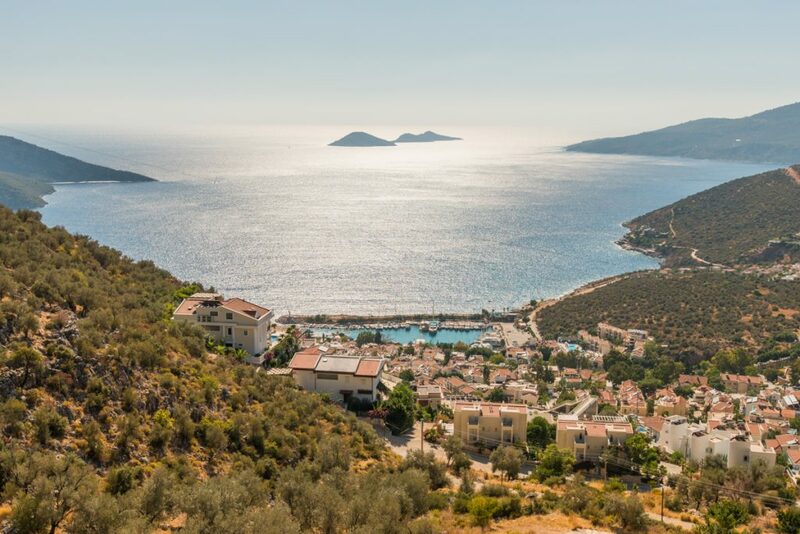 From here it is a mere 10 minutes downhill walk to Kalkan town itself. 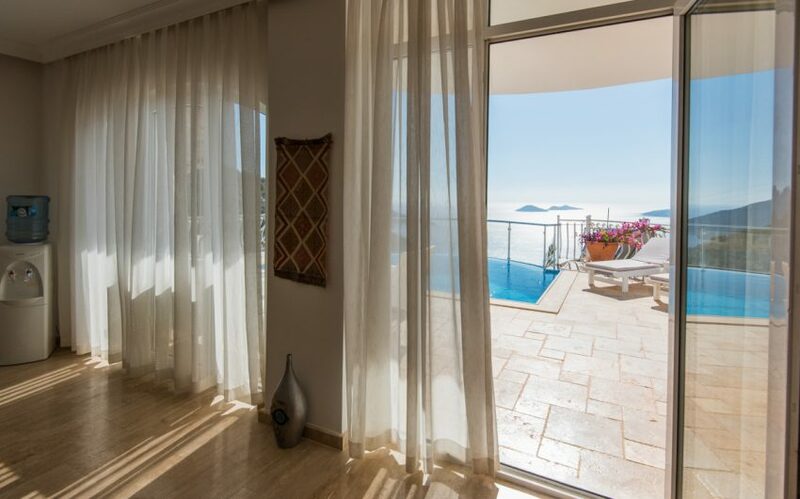 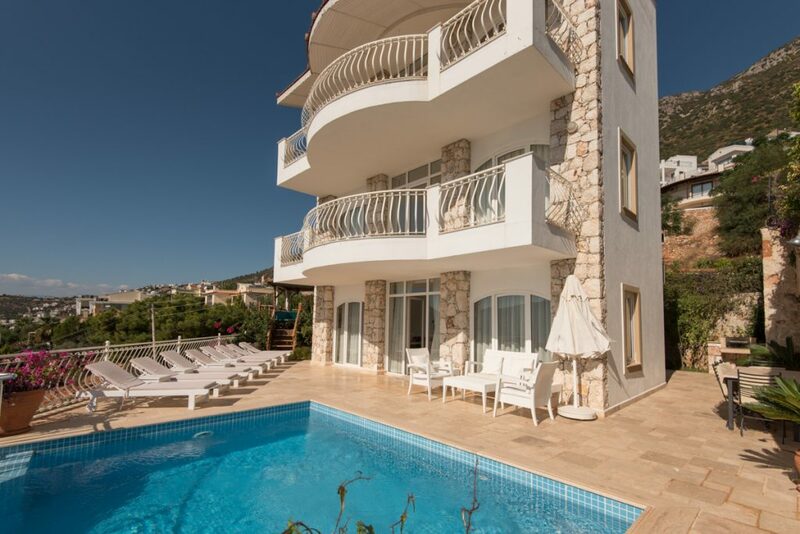 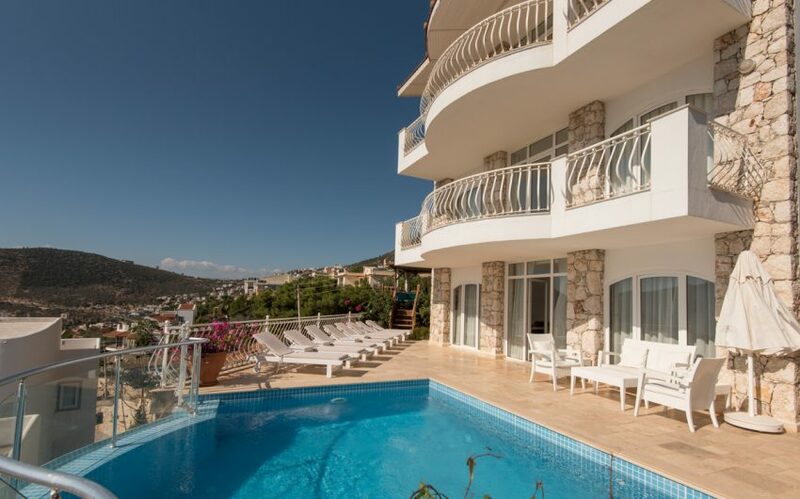 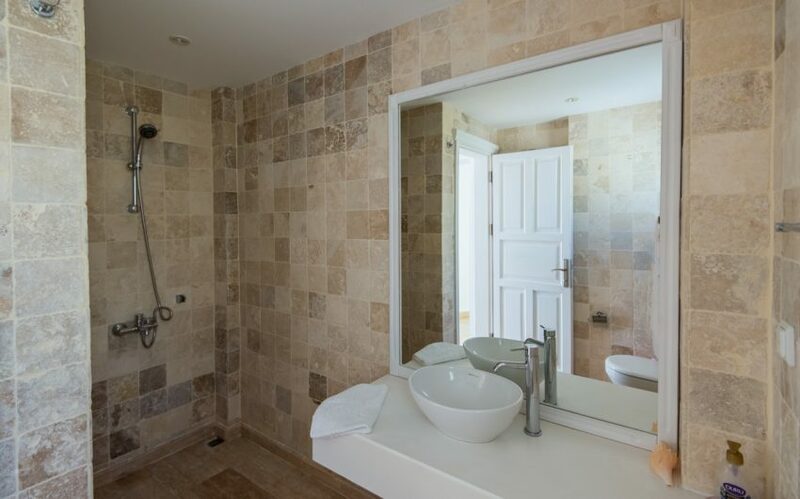 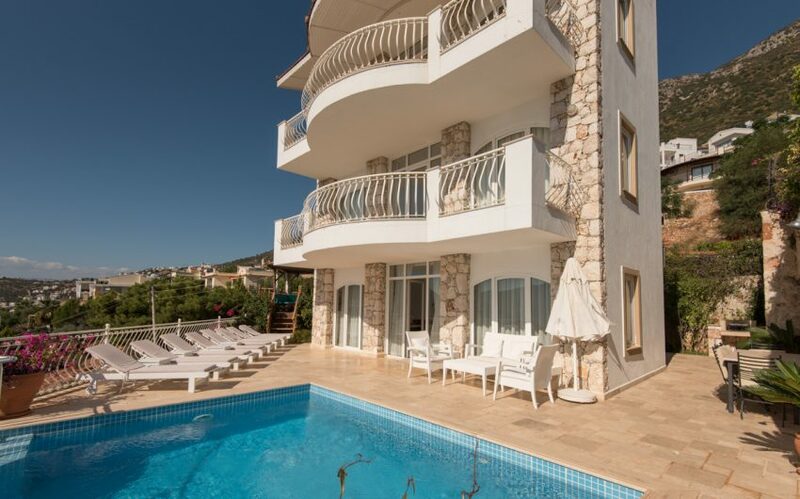 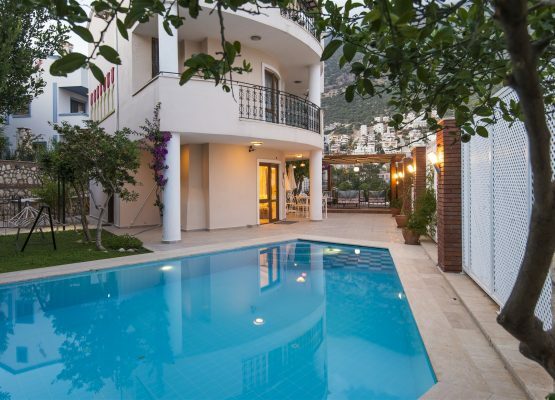 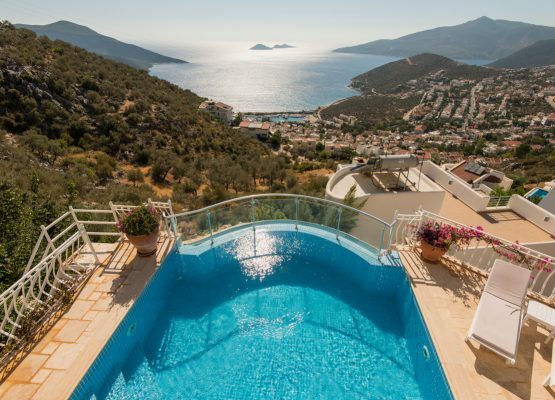 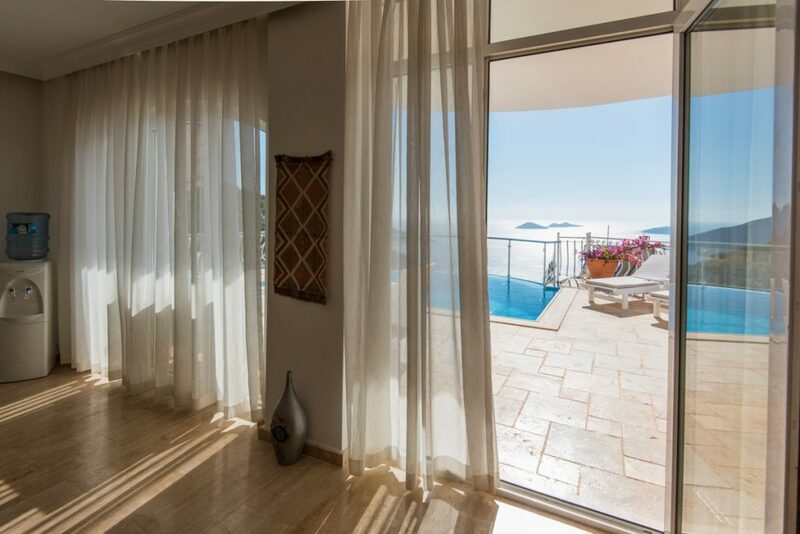 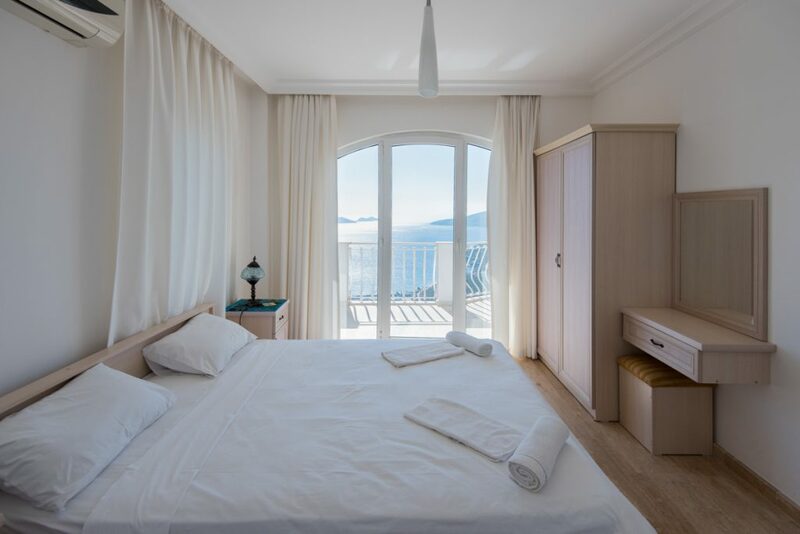 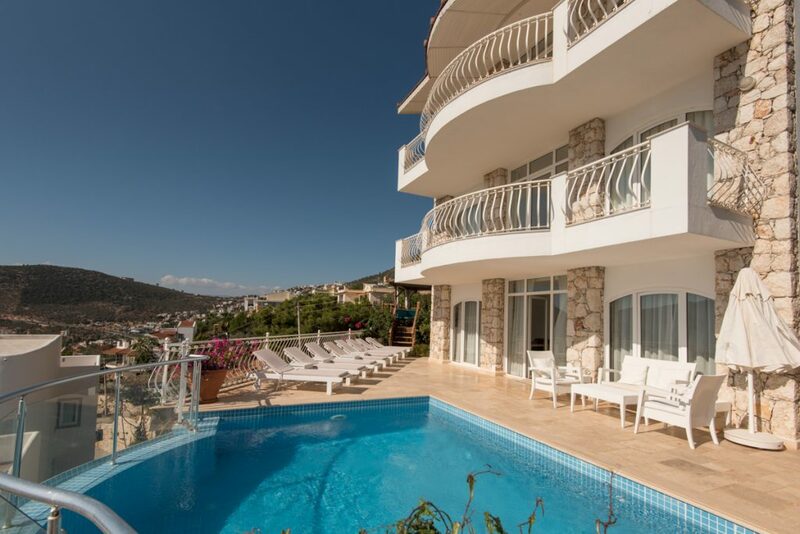 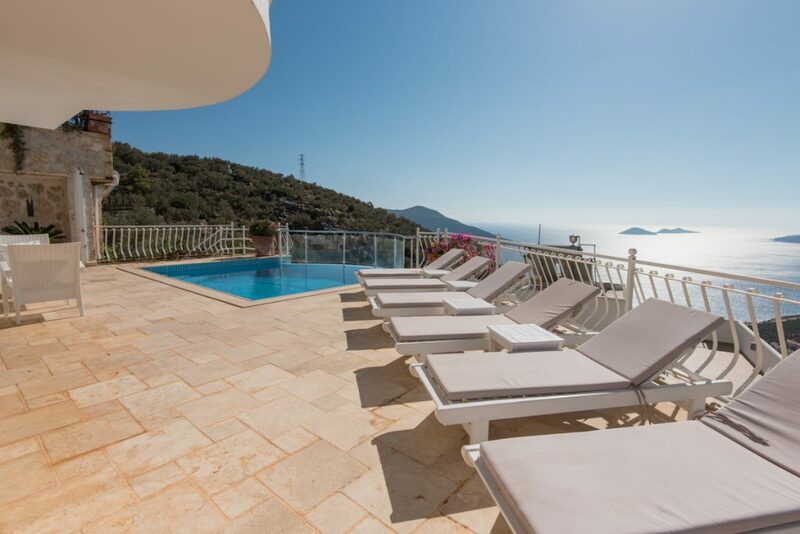 This villa not only boasts captivating views; it possesses lovely light, airy open plan interiors as well as superb exterior areas which include a beautiful pool looking out over the Kalkan bay; large terrace area encircling the property with lush borders containing well established plants, bougainvillea, banana and delectable pomegranate trees. 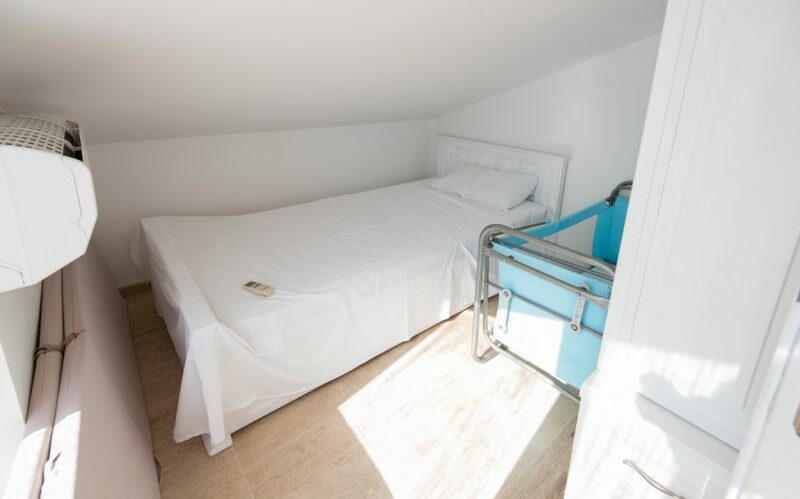 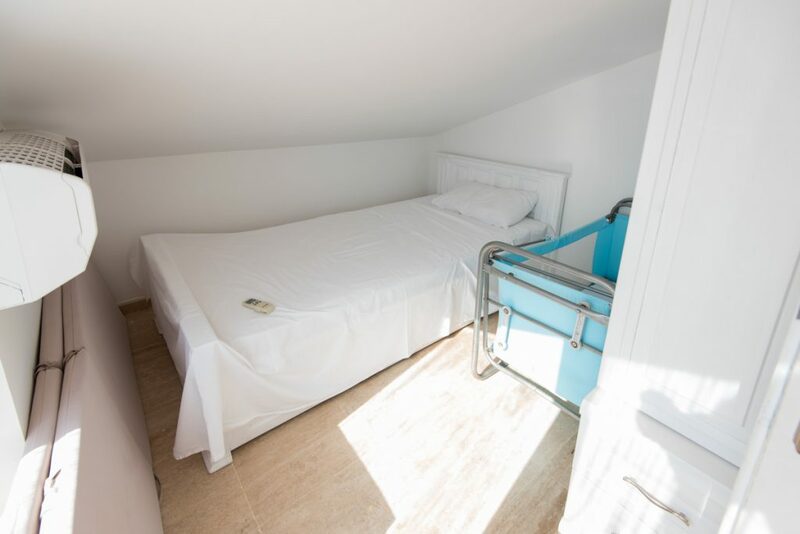 And a ‘secret escape’ – The Games Room, just a few steps down from the terrace, cool and out of the glare of the sun, containing table tennis and pool tables for your enjoyment. 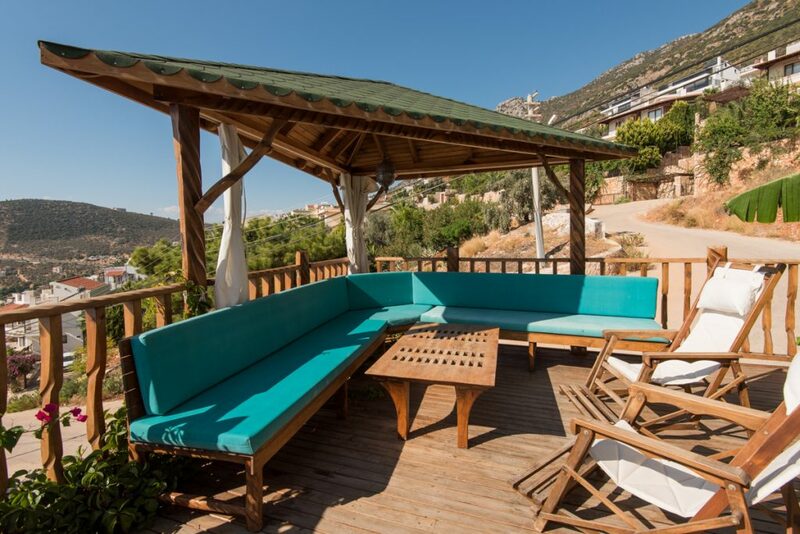 Ample comfy sunbeds, seating and a large dining table and chairs apportion the terrace and pool area. 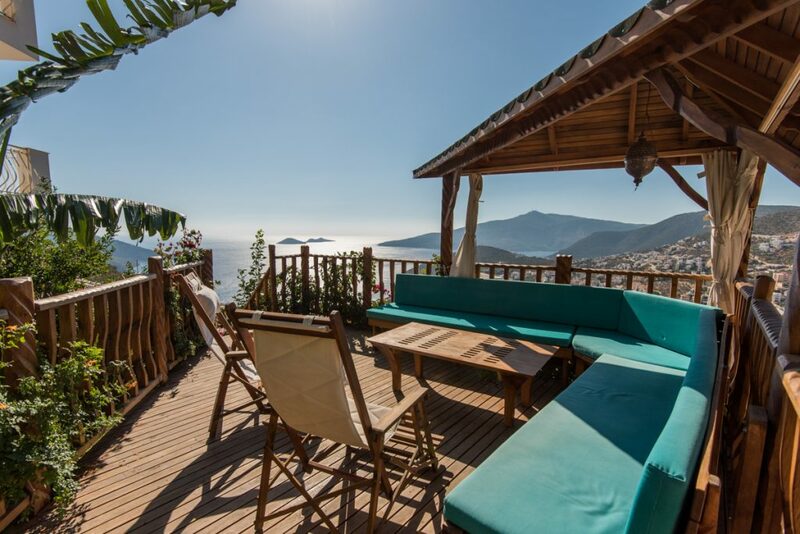 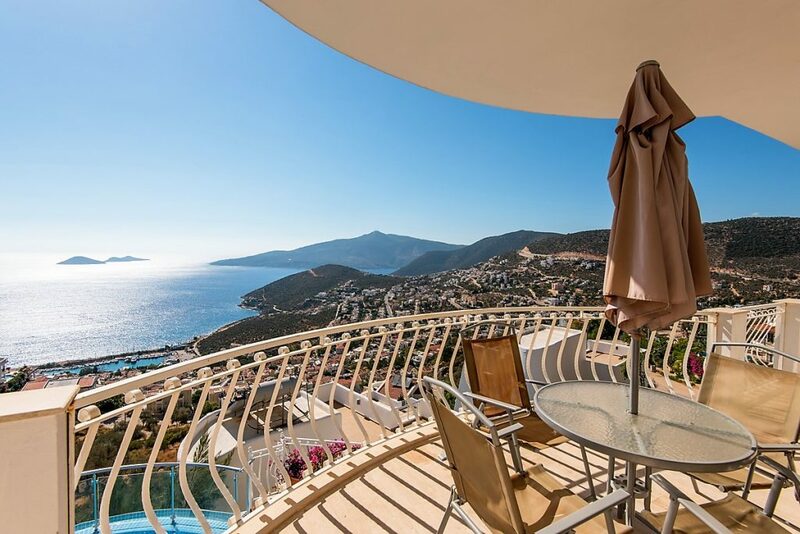 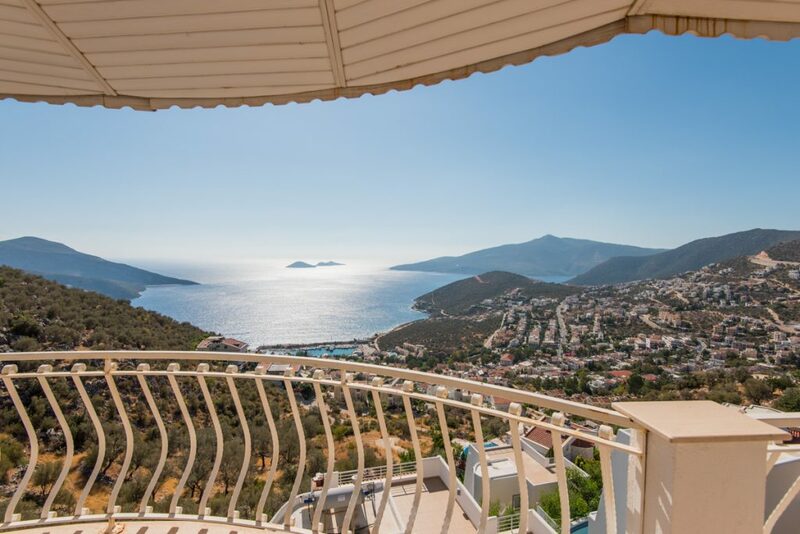 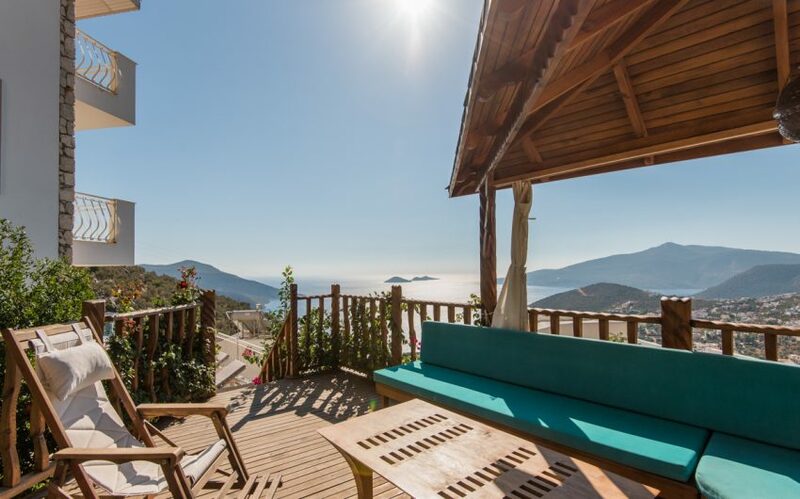 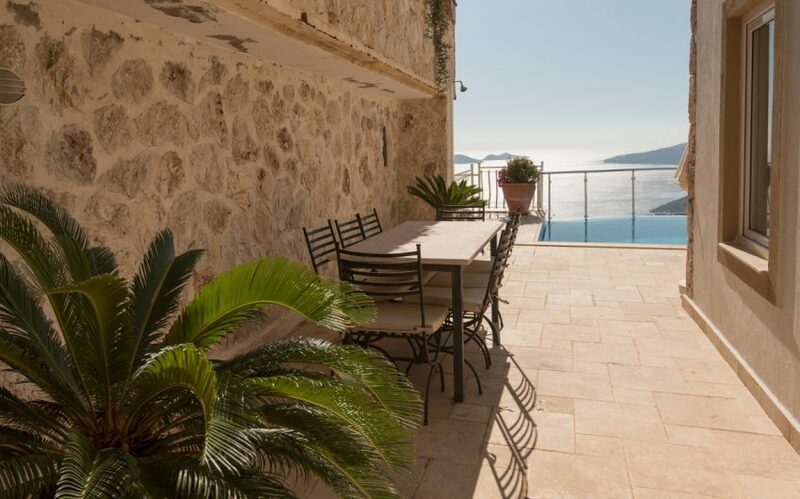 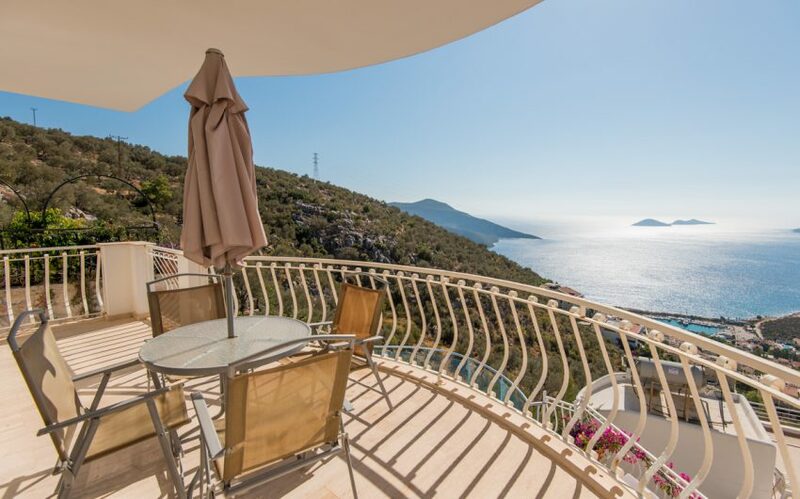 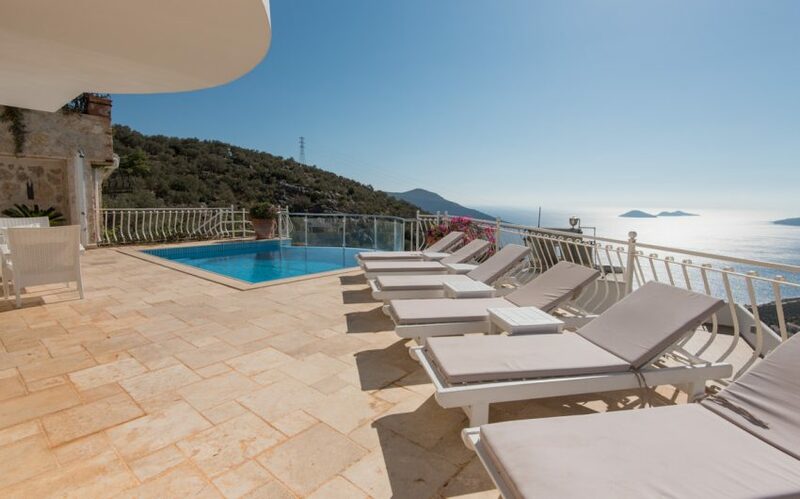 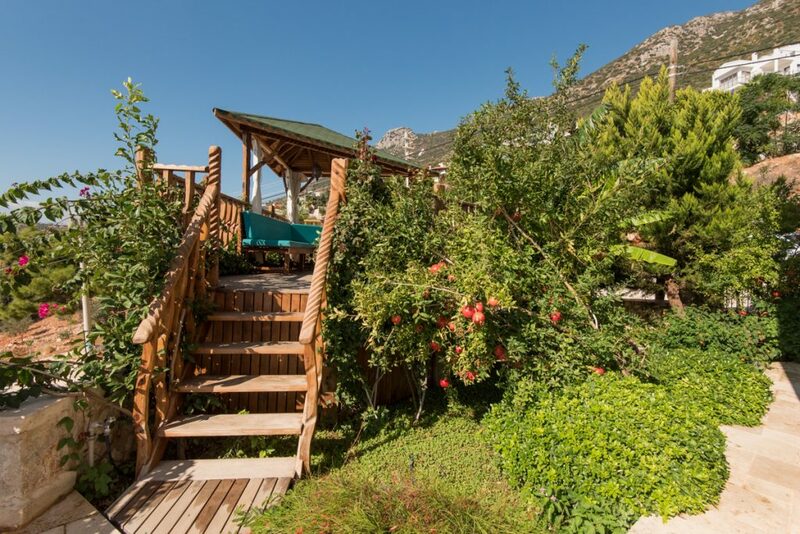 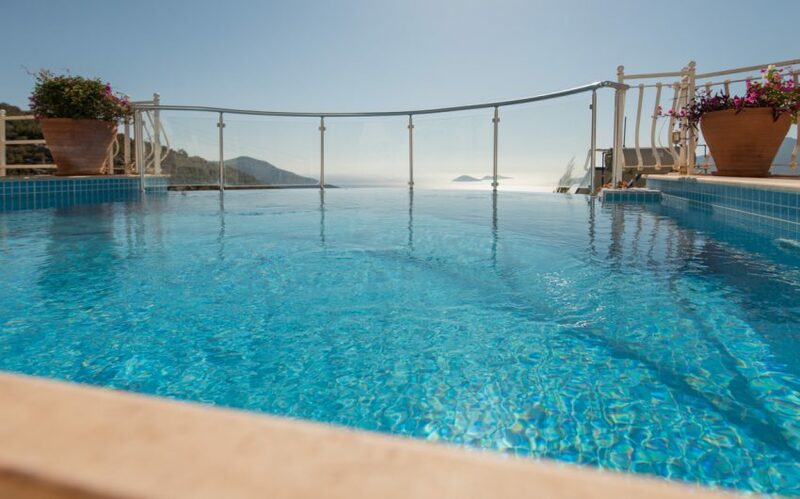 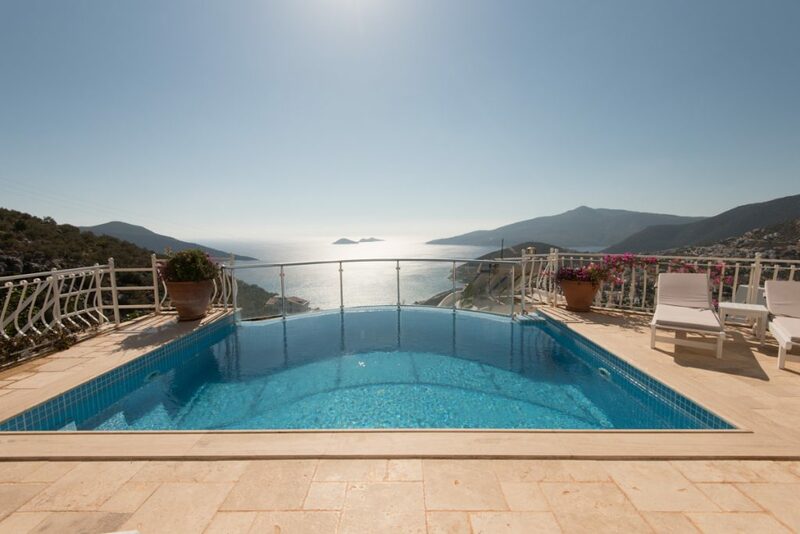 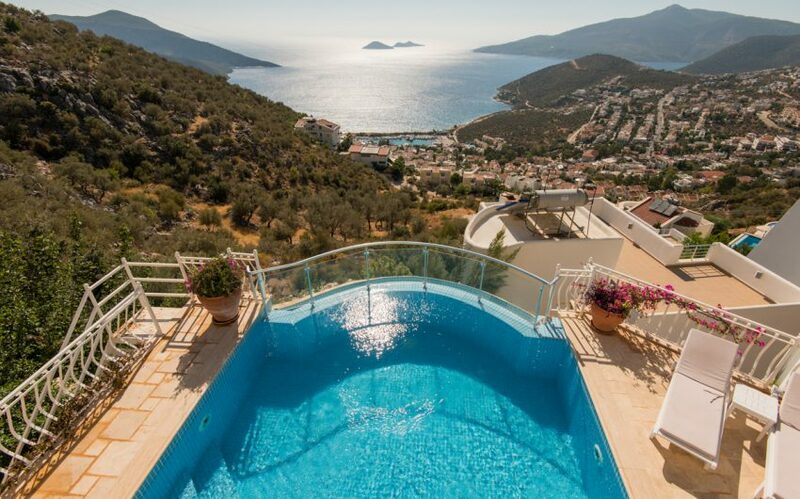 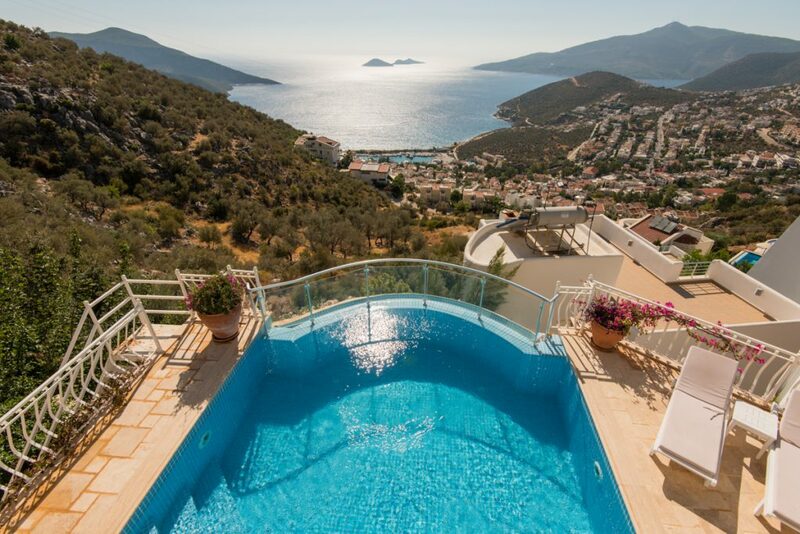 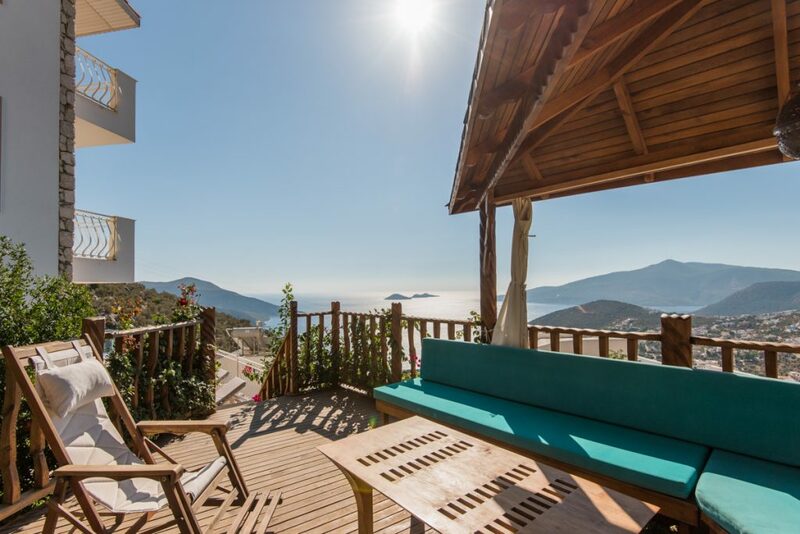 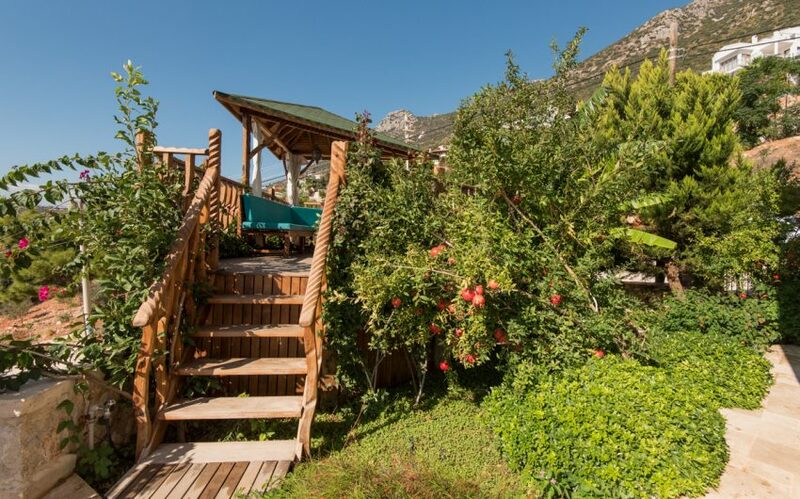 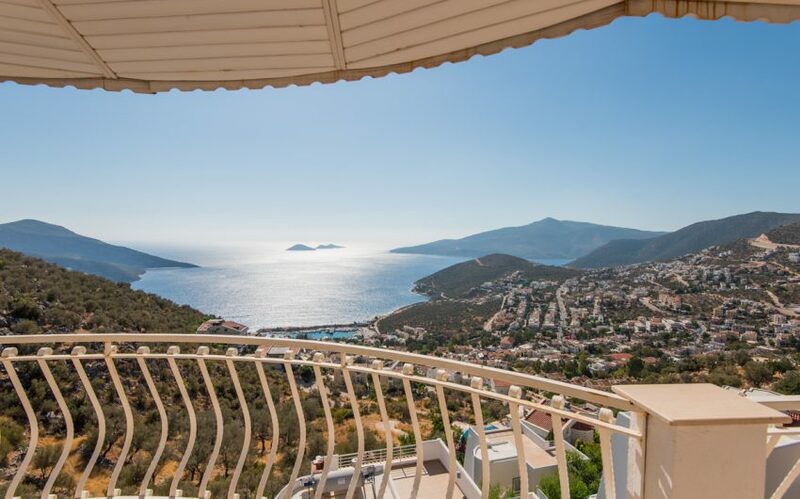 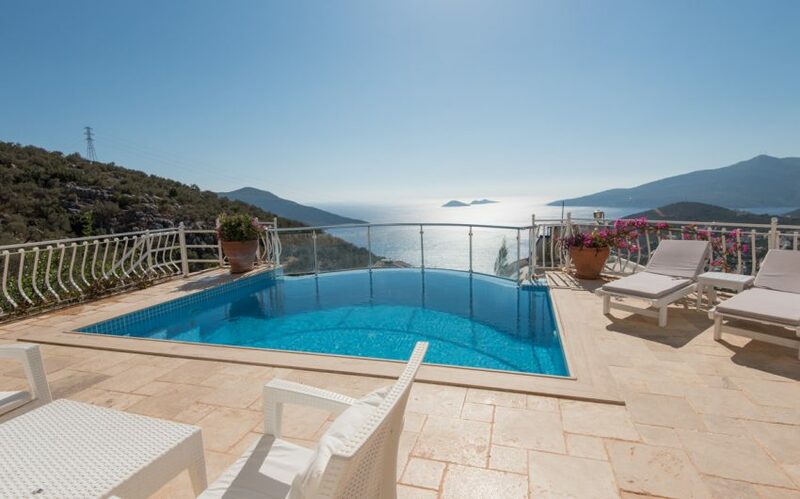 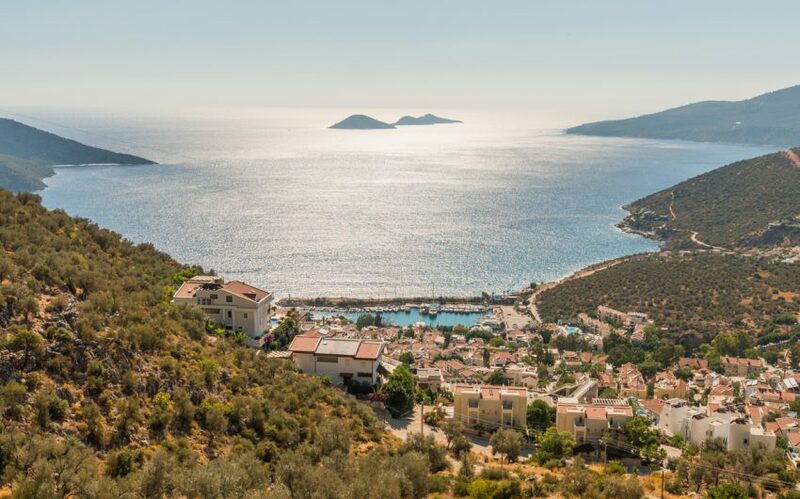 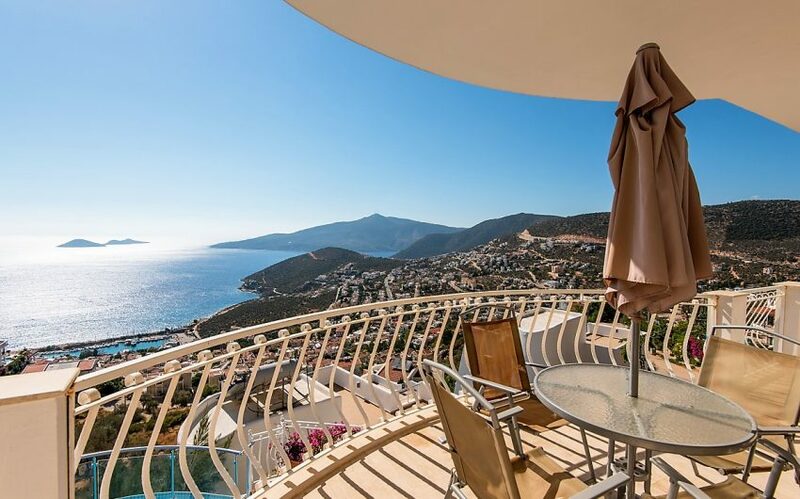 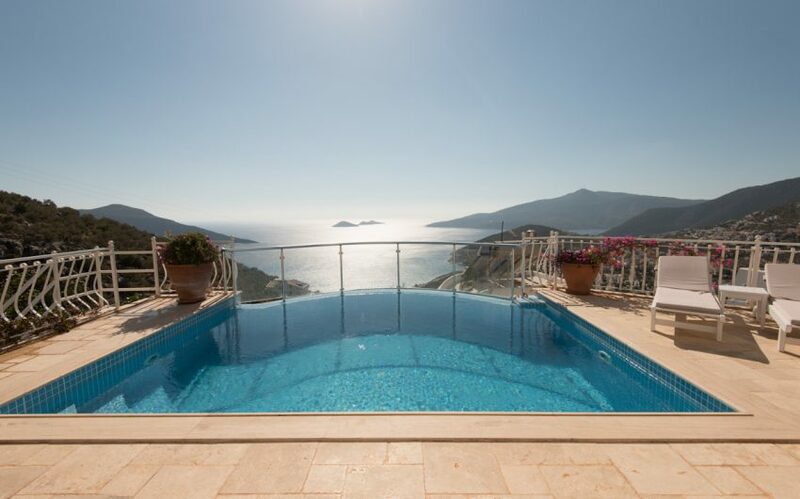 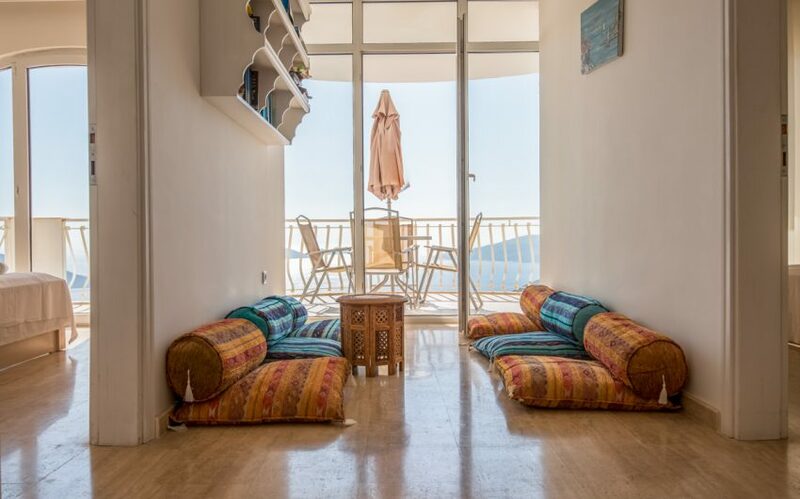 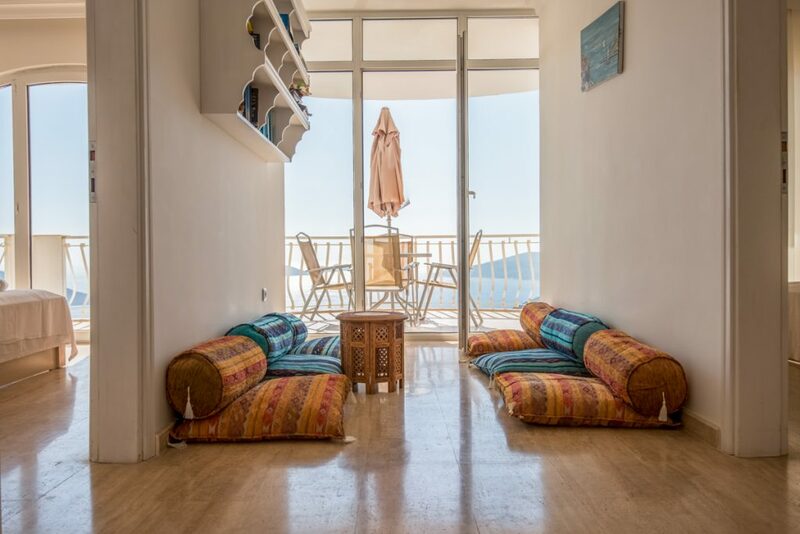 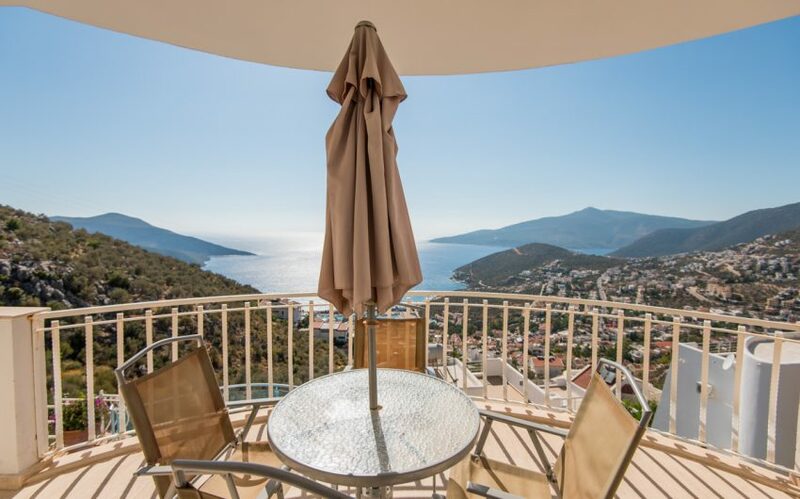 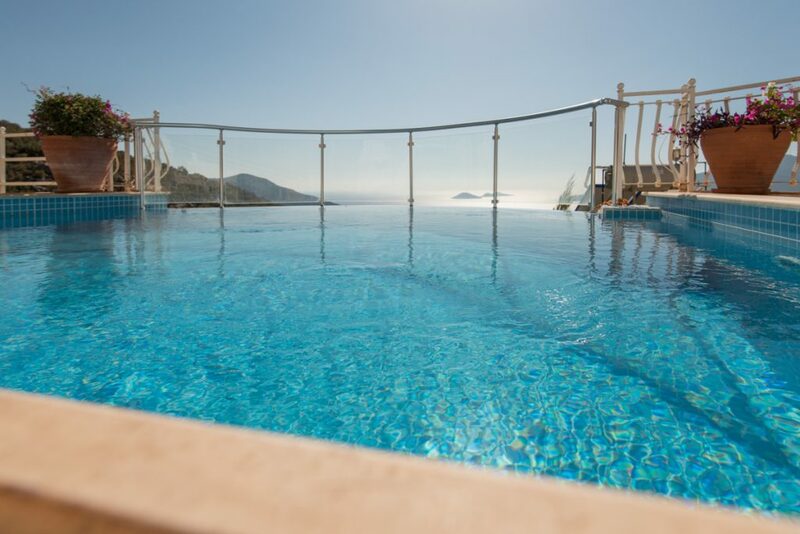 To the rear side is superb a BBQ for your use on nights where you’d prefer to ‘simply be’ at the villa and perhaps repose with your favourite tipple to enjoy the spectacular sunsets Kalkan is famous for. 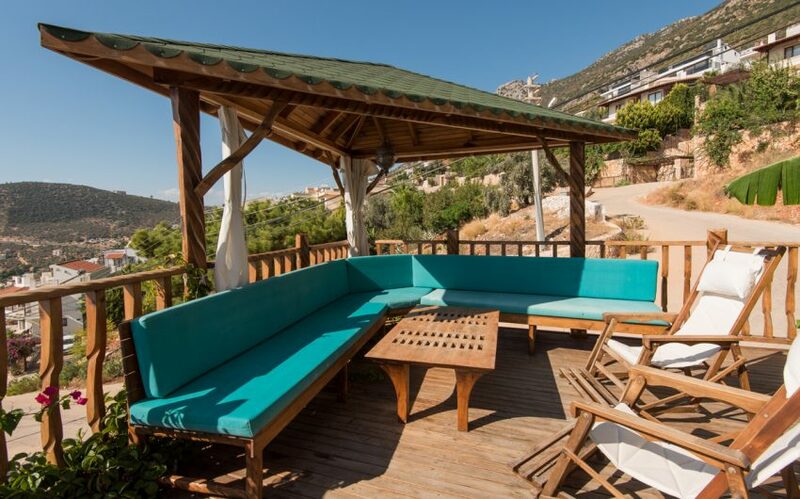 One of the outside spaces we know you’ll take great pleasure ‘chillaxing’ in is a gorgeous decked area complete with triangular gazebo, padded seating and coffee table with pretty lantern above. 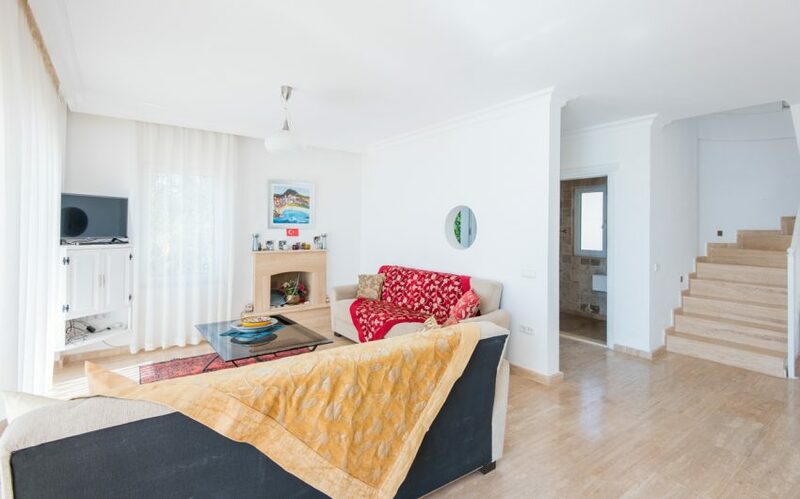 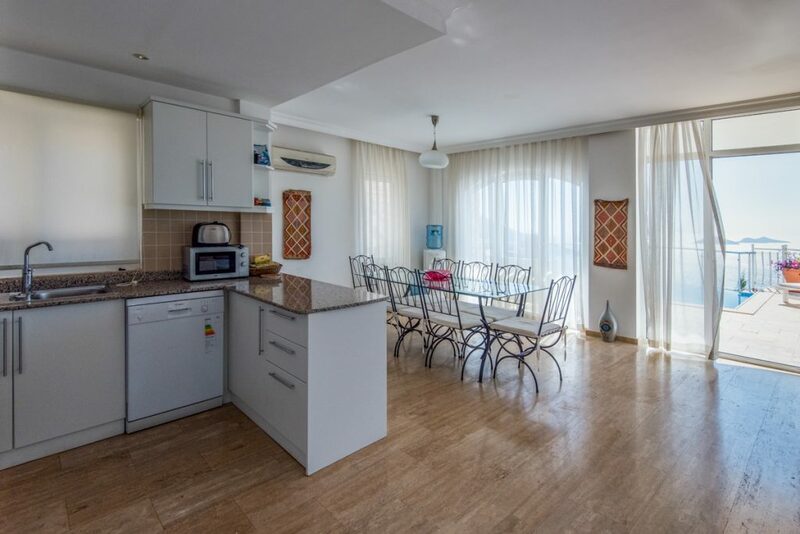 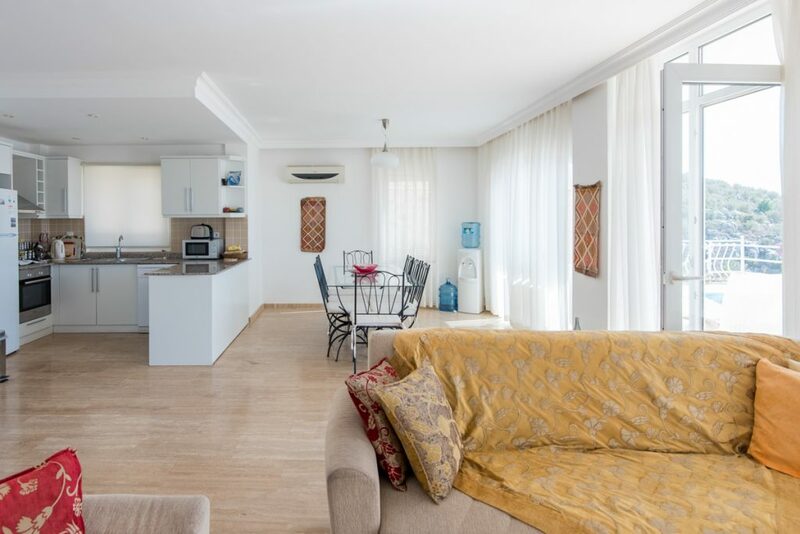 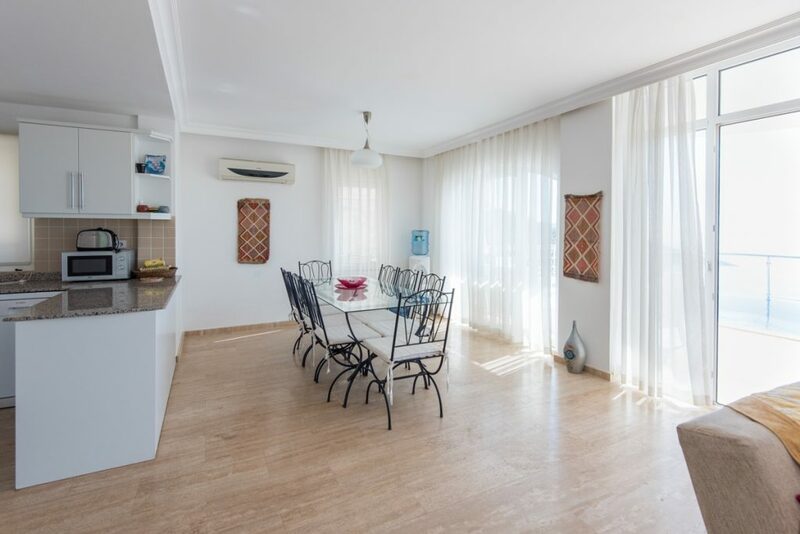 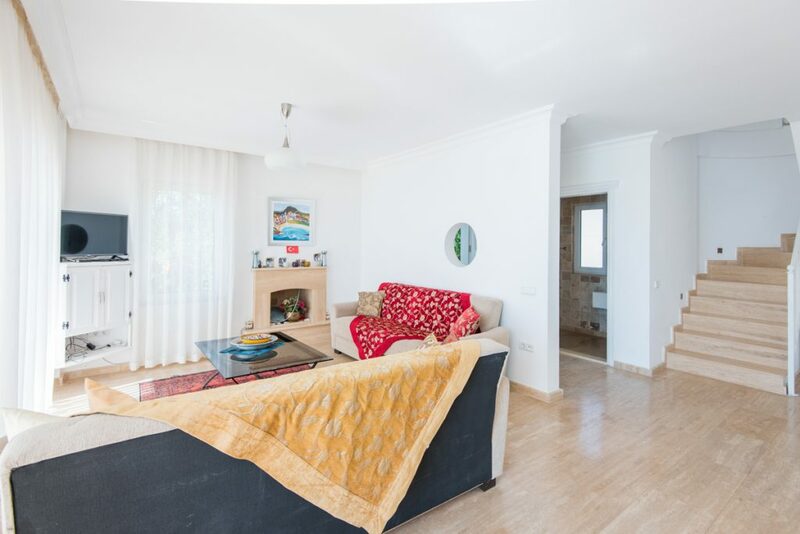 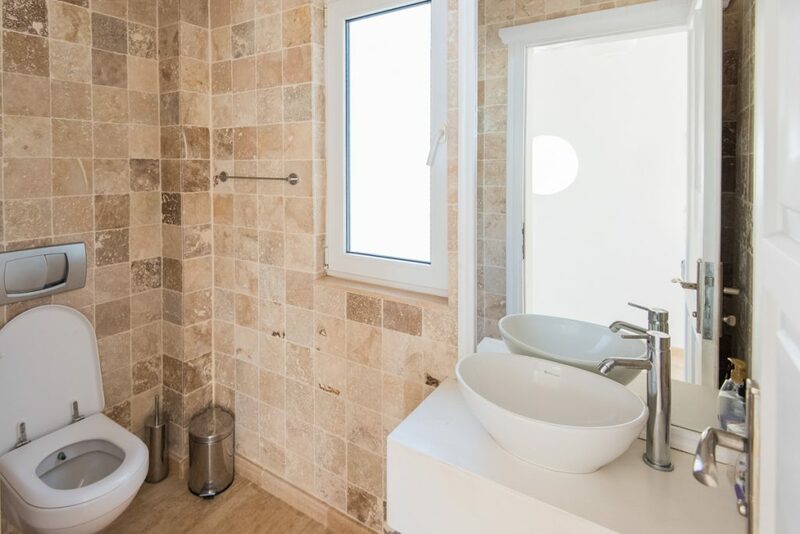 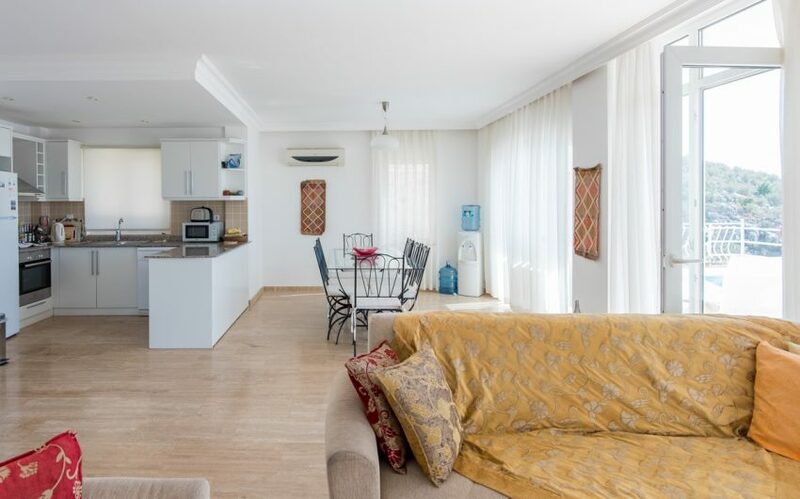 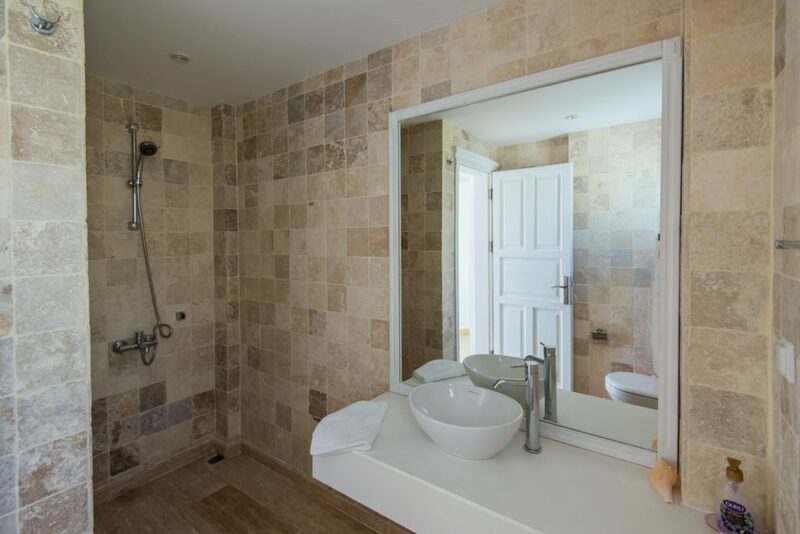 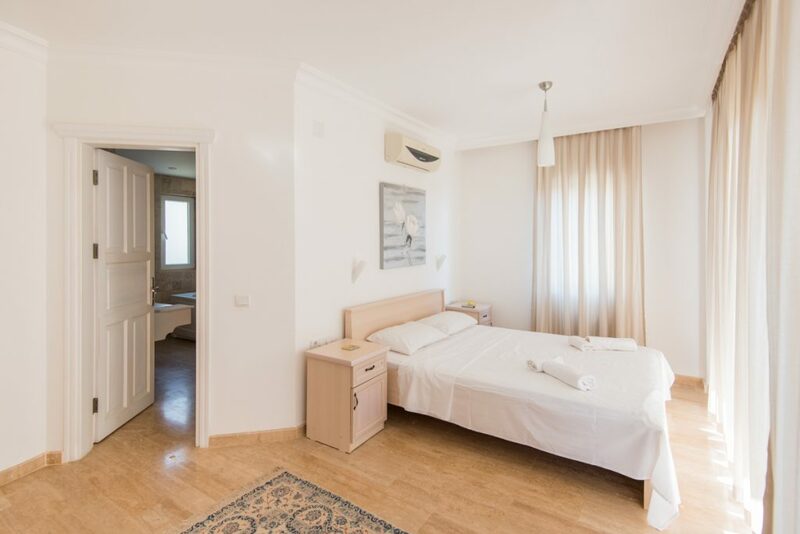 The main living area on the ground floor is an open layout with a well-equipped kitchen housing a fridge freezer, microwave, oven and dishwasher. 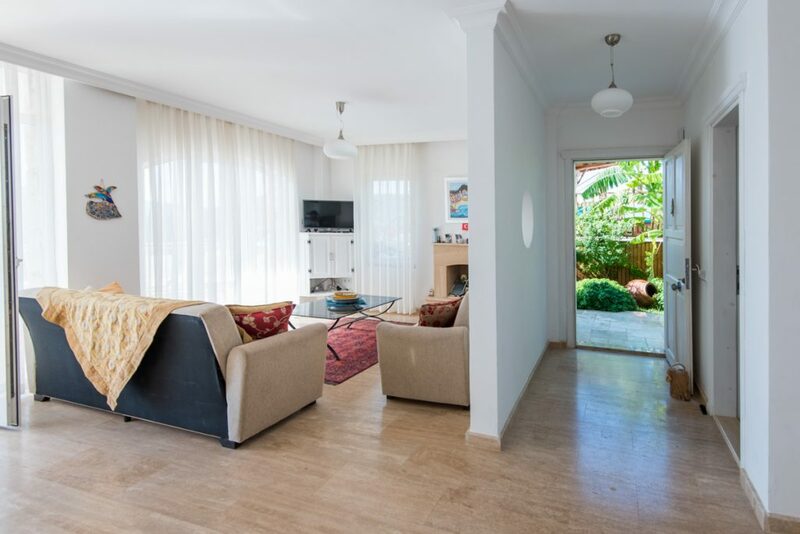 Large glass dining table and chairs to one side and homely sofas, surround the rug and coffee table to the other. 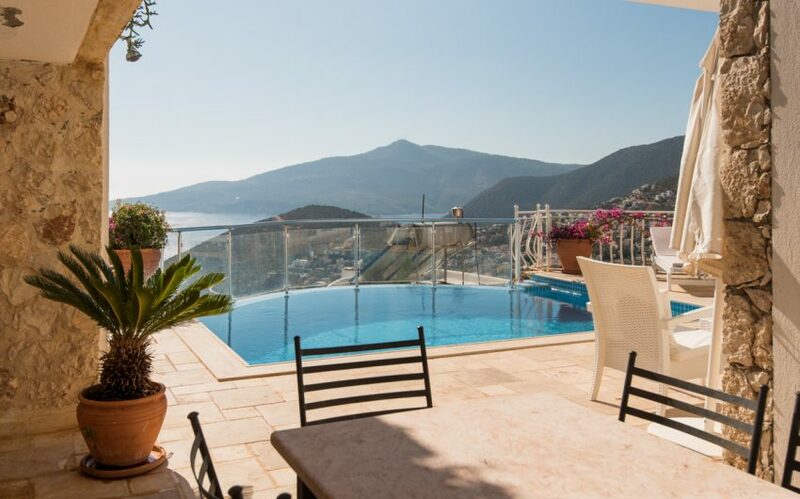 And should you tire of that view the TV with euro satellite is on hand as is Wi-Fi throughout. 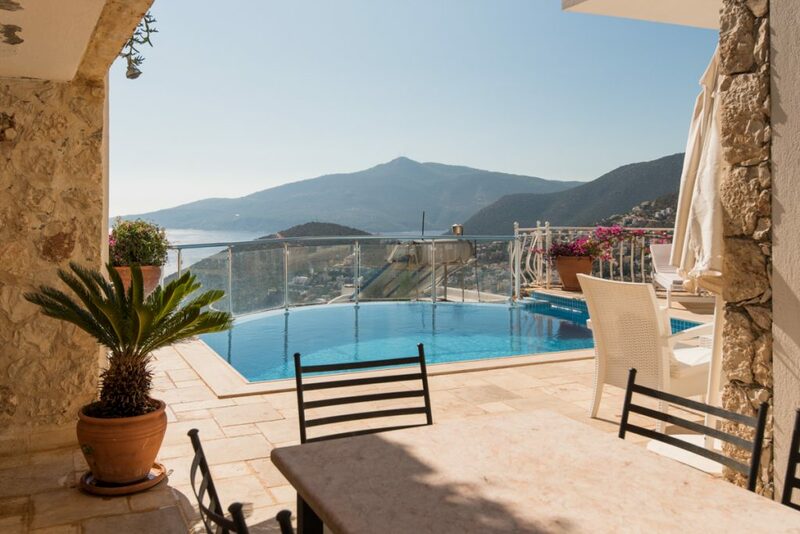 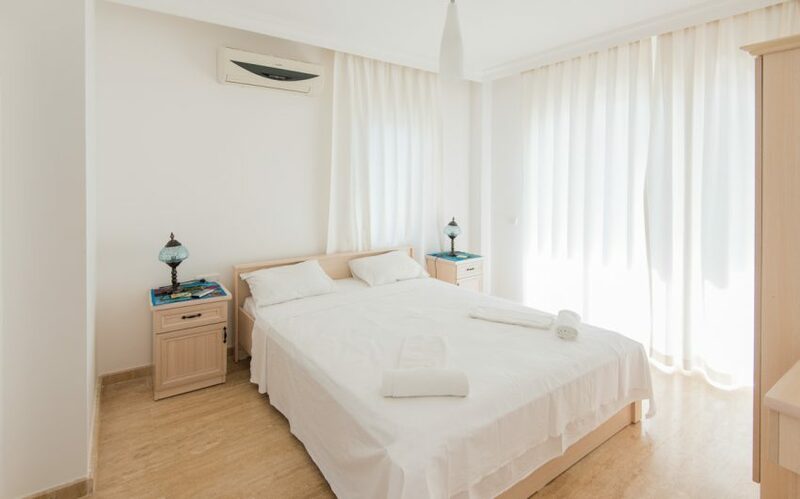 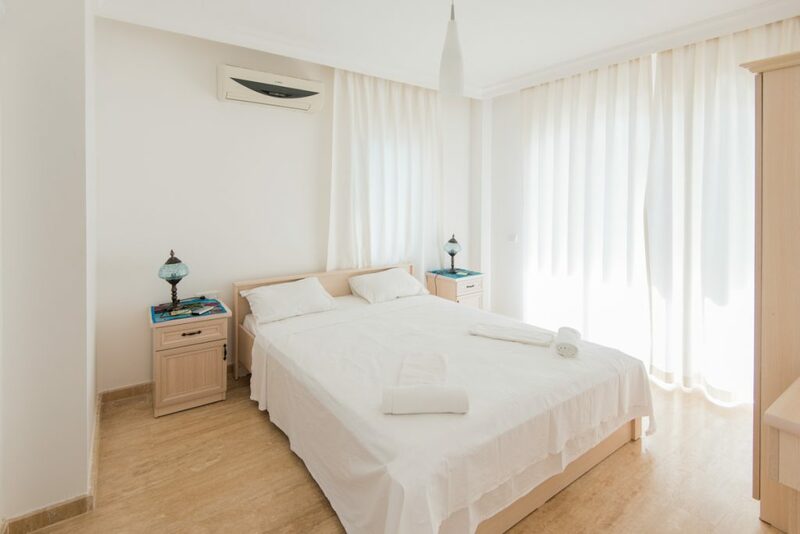 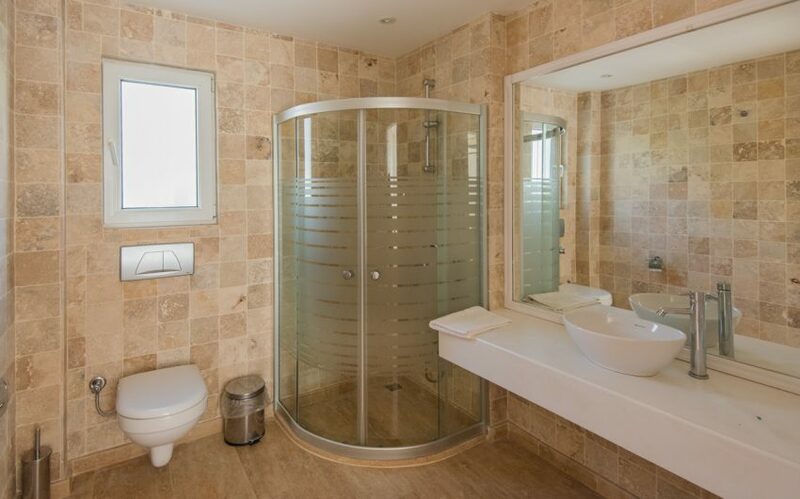 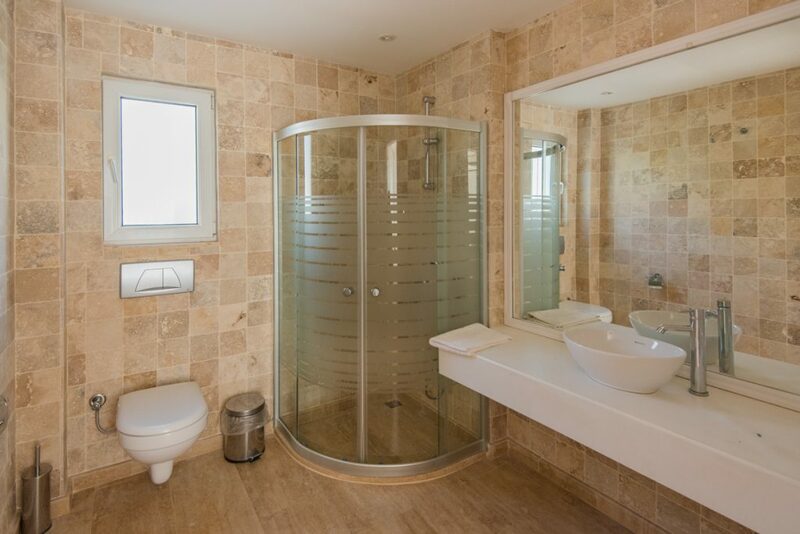 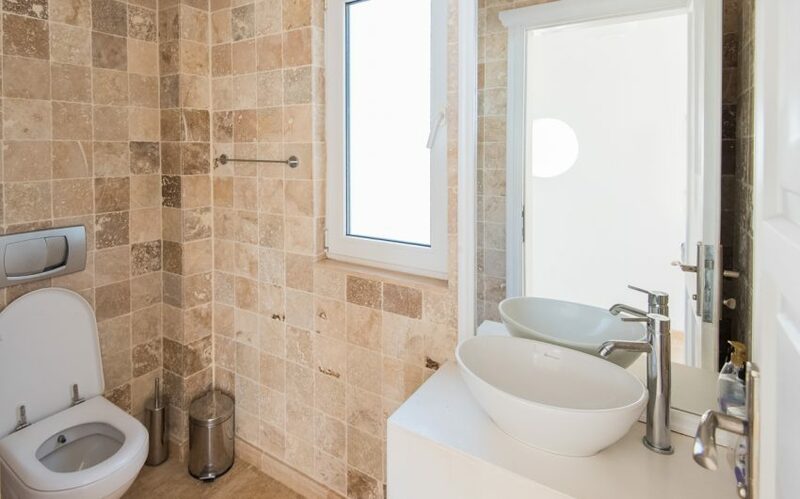 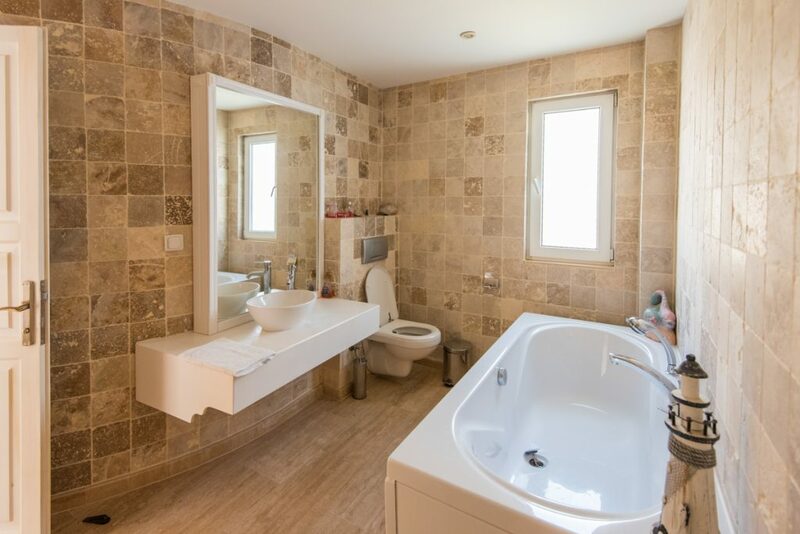 We can highly recommend this villa for a large family group with teenagers or a group of friends. 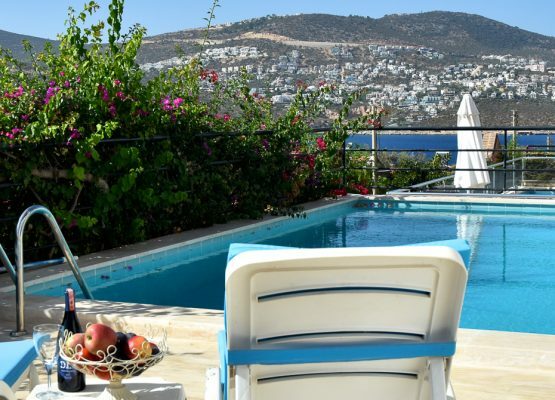 We urge you to book as soon as possible as peak season this will be an extremely desirable choice.